Your MCNY Account is your electronic key to all things MCNY. Most systems requiring authentication at MCNY utilize your MCNY Account credentials. 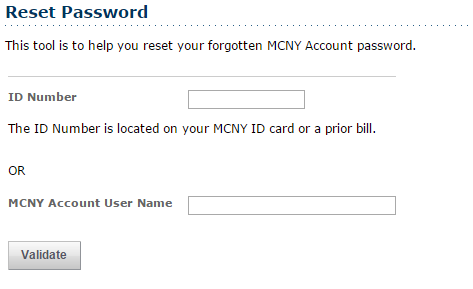 Remember to keep your MCNY Account credential private. 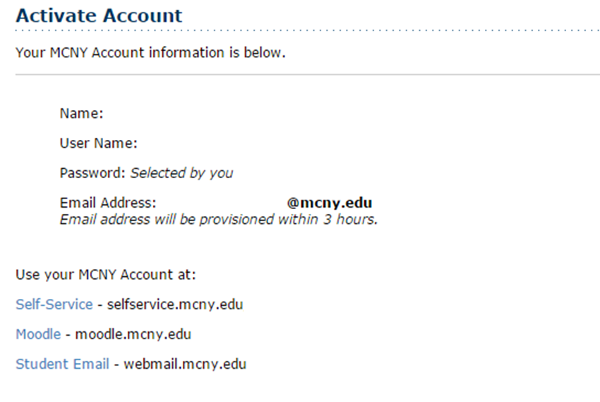 Activate Account - The Activate Account page allows accepted students or alumni to create their MCNY Account. Read the Activate Account Instructions. 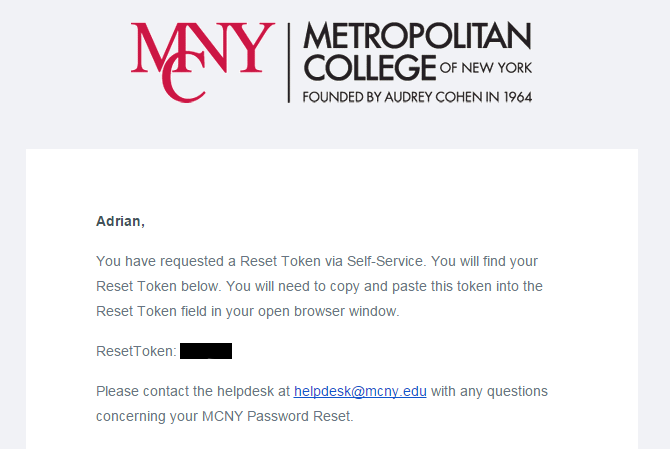 Reset Password - If you have forgotten your MCNY Account password, use this utility to update the password. Read the Reset Password Instructions. Change Password - If you know your password, use this utility to change your password. You will be prompted to login (if not already authenticated). Step 1: Provide all requested information. ID Number is supplied in MCNY Account activation email. Admissions and Student Services are also able to provide the ID Number to you. 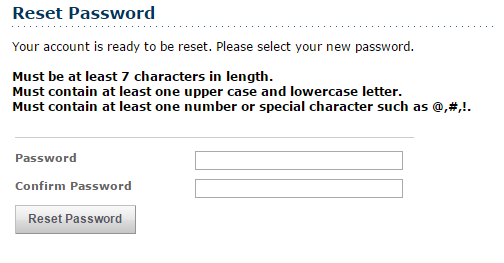 Step 2: Select a unique password that meets the minimum password requirements. Step 3: Your user name and MCNY email address is assigned to you. Please make a note of them for your future use. You should also receive a copy of this information via email at the address you provided MCNY during application. Step 1: To reset your password you will need to supply your ID Number or your MCNY Account User Name. 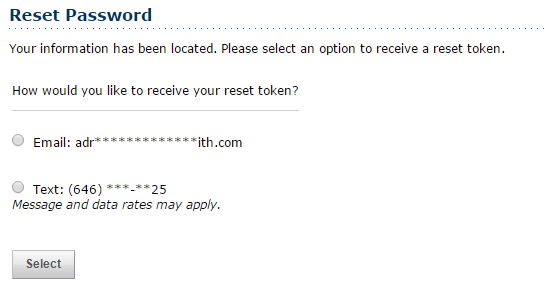 Step 2: Select how you would like to receive the account reset token. If you select text, please ensure that the masked number shown is able to receive a text message (Message and data rates may apply). Step 3: Check your email account or cell phone to retrieve your account reset token. 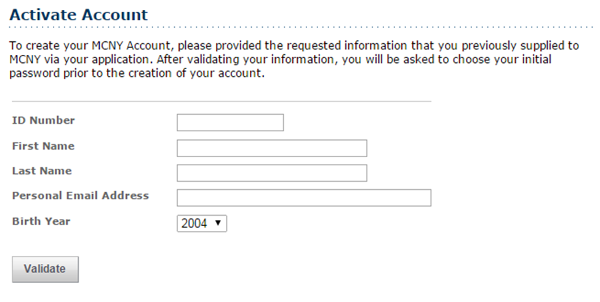 Step 4: Enter the account reset token. 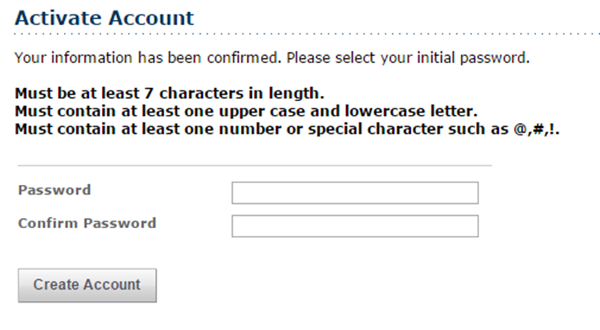 Step 5: Select a unique password that meets the minimum password requirements.